There are some things I never thought I’d do in my life. Don’t get me wrong; I think we’re capable of anything. Some experiences are so petrifying though that they are unfathomable. That was cage diving with great white sharks for me. It combines all of my greatest fears in one situation. Using a regulator under water, being surrounded by massive, man-eating monsters in the ocean and being confined to a cage were the epitome of torture, but I learned that knowledge breeds comfort in even the most terrifying situations. I spent the last five days on an all-inclusive great white shark diving trip from San Diego aboard the M/V Islander with Islander Charters. I needed to learn more about the behavior of great whites to try and overcome my fear of such ancient creatures. I’ve always had a vision of them lurking in the water waiting to attack humans. Blood thirsty, gigantic monsters was my vision of them, but I was naive. I used movies and tv shows as my basis for knowledge and I had a ridiculous version of what what out there. Getting in the water with them and learning from the trained crew aboard the Islander has completely changed my perspective on these beautiful, majestic, graceful animals, but it wasn’t without great struggle. When we arrived at Guadalupe Island, we were divided into two groups of eight people and then subdivided into two more groups of four. There were two cages in the water at all times with four people each and we worked on an hour rotation giving us a total of 12-15 hours of dive time. Admittedly, I struggled more than anyone else there. I was embarrassed at first and I considered leaving this part out but I want you to know the truth and then you can decided for yourself if it’s something you’d like to have on your list. I was in the first group of divers. I’m not PADI certified and I’ve always struggled with using a regulator. It feels completely unnatural and I usually have a panic attack. This time was no different. Three other people in my group, including one guy who’s never even worn a wet suit, put the regulator in their mouth and climbed down the ladder into the cage. They made it seem fine. There was already a shark around the cage and they never came back up after getting in. My heart was pounding out of my chest. I couldn’t breathe and I wasn’t even under water yet. I was overcome with fear. I couldn’t function. The dive master, Jimmy, tried to help me calm down as I sat on the top of the cage with a great white swimming around but I was inconsolable. My wet suit was choking me. I couldn’t catch my breath. I started to cry, which I can’t really explain. Then, I didn’t want to look at anyone because I was crying. It was all too much. Once Jimmy realized that I couldn’t handle it, he left me to sit on the top of the cage and never questioned me. I was grateful that he didn’t force it or try to give me more directions. Out of the hour, I might have stayed in the cage for a total of 15 minutes. I did see a shark while I was in the cage and I wanted to stay down and experience more but it was complete sensory overload. The next try was slightly more successful and I managed to stay under water for 30 minutes. The more sharks came around, the more comfortable I felt. Isn’t it ironic? They distracted me from my other fears. I expected them to be vicious and frenzied, but it was nothing like that. Usually, there were only one or two sharks in sight and they moved gracefully through the water. Sometimes they didn’t even take the bait and they had no interest in coming too close to the cage. When no sharks were in sight, that’s when my mind would wander and I would panic. By the third try, one of the crew said to me, “You’re a mother. You got this. Mothers are fearless and capable of anything.” It really resonated with me. I tried to eliminate some of the issues I was having by unzipping the wet suit and getting in the cage last so I didn’t feel rushed. I took several deep breaths and closed my eyes to relax. 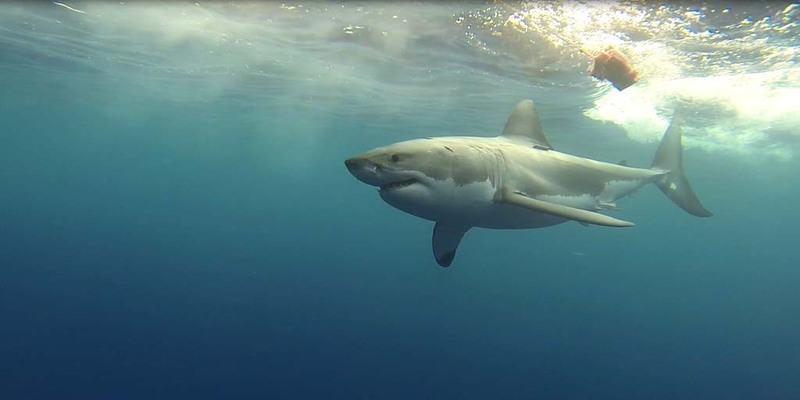 I climbed down the ladder and there was a great white shark directly in front of the cage. He wasn’t as large as some of the others but he was still about 10 feet. I looked him in the eyes as he moved closer and closer. It felt like he was looking at me. We stayed like that for a few seconds but it seemed like a lifetime. Unconsciously, I smiled. He looked like he was smiling at me. I felt water hit my face through the creases of my mask when I smiled but I didn’t look away or move. Then, as quickly as it happened, it was over. He moved along and disappeared in the distance. And that was my moment. Every other second in the cage felt more comfortable after that. The wet suit didn’t feel as uncomfortable. I wondered why I struggled so much with breathing and the sharks didn’t appear quite as monstrous. I didn’t get out of the cage early again. I utilized every second to learn more about their behavior and movements. 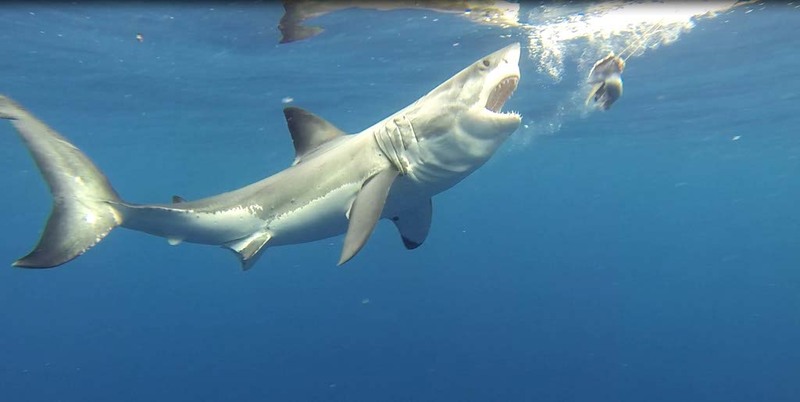 Even when larger sharks ate the bait directly in front of the cage, I noticed their gills and the different shapes they made with their mouths but I wasn’t fearful. The true test was when there were no sharks in sight and it became a waiting game. Even then, I held my composure. Everything changed. Watching the behavior of 15 different great white sharks over a total of 12 hours has been one of the most eye-opening experiences of my life. Thousands of professionals could have explained the behavior of great whites to me but no explanation could truly do it justice. I needed to experience it for myself. I no longer see them as monsters lurking in the depths. They are magical. 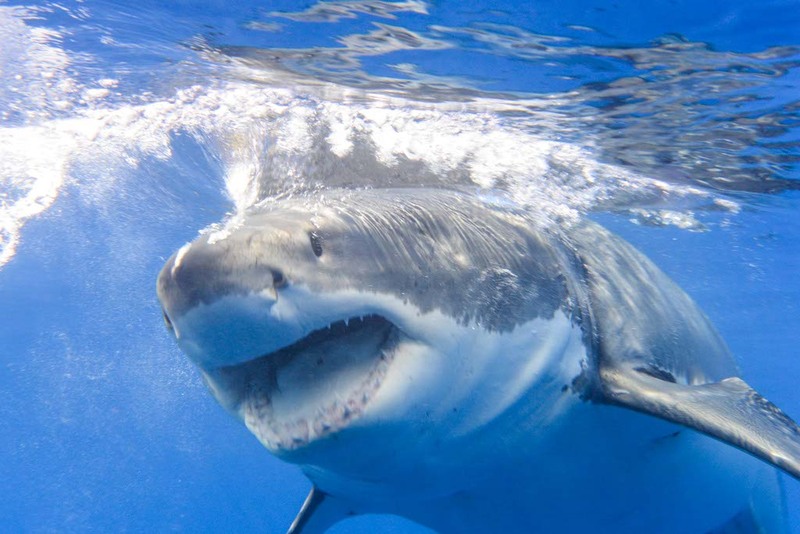 I don’t know if I’m ready to hop in without the cage just yet, but I certainly have a new appreciation and respect for one of the most feared creatures in the ocean. Amazing story! I could feel the choking and trembling while I read. I love the incredible photos too! Thanks for sharing every little detail. It adds up greatly to the whole picture. Thank you, Svet! It was an incredible experience. I would recommend it for everyone even if it’s a huge fear. Absolutely amazing Lesley! I’m so proud of you, I’m speechless. Thank you! It was nothing like I expected, but completely life changing. I’m still in shock. This is an amazing story and you are very brave. I can’t imagine anything more terrifying than having those giant sharks swim right up to you … maybe I’ve watched Jaws one too many times! It’s such a different experience when you’re actually near them. All my fear has changed to curiosity. Do you like snorkeling and diving, Monica? Have you had under water encounters with any other marine life? I hope your dream comes true as well. It was a great experience and I don’t think many people were more scared to get in but I still think it’s amazing. What an incredible experience! As big as they are, the power and grace of these fierce creatures are unbelievable. I think that studying them in their own habitats and monitoring their mysteries are incredible. Me too. It completely changes the way you see them. I’m grateful for the opportunity and for over coming my fear enough to have the experience. It’s hard to believe where our mind goes in stressful, fearful situations. Sometimes it can be difficult to overcome the emotions but I’m so grateful I managed to get passed it. Lesley, I wouldn’t have got in the water! To me this is a perfect example of not doing something just because everyone says you should. It’s never any fun having anyone else’s holiday regardless of the activity or destination. No traveler needs to make an excuse for not doing something! Oh no, Jo. I’m so glad I got in the water. It wasn’t about doing it for someone else. I wanted it more than any adventure I’d had in my life. The cages are safe and the company is the best in the industry. I am so grateful that I overcame the fear because it was one of the most beautiful experiences. I truly loved watching them move and act and react in the water. I wish I could do it again and again. Many of the best experiences in my life involved getting passed some of my greatest fears. This was living a dream. I feel more confident and capable. I got more out of this adventure than I ever imagined possible. I would probably be freaking out too but I’m sure it’s going to be an amazing experience. Thanks for sharing your story! This makes me definitely want to do this. We went cage diving in South Africa (www.economicalexcursionists.com/wine-and-sharks-an-unlikely-combination-for-a-great-day/) and it was out of this world!! Like you said, it was terrifying at first, but then you totally get sucked into their beauty and power! Lesley, it is great to hear that you were able to progressively overcome your fears, and that you had enough time and options available that you were able to get to the point where you could participate. 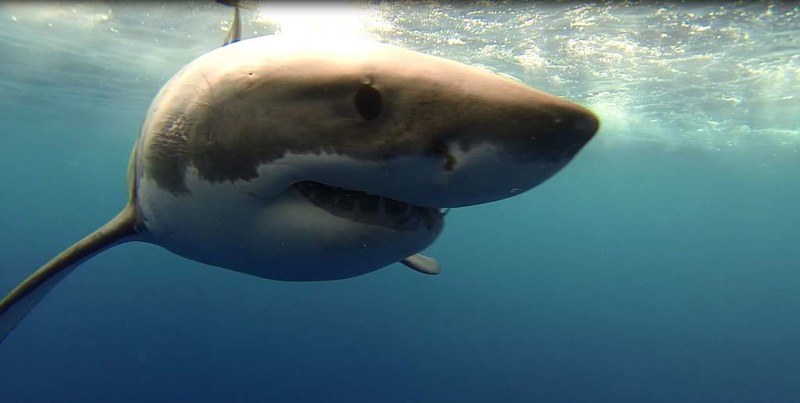 I have never dived with great white sharks, but I have done other shark dives and I would definitely love to have a similar experience to yours! I could feel your fear and was right there with you, feeling choked by the wet suit, unable to breathe, and panicky. But I agree with your dive instructors’ advice: “You’re a mother. You got this. Mothers are fearless and capable of anything.” And I get the irony that it was the sharks themselves that calmed you down. A growth experience for sure, maybe not for everyone. An honest, thoughtful post. I’m too scared to dive, never mind the shark part lol. Awesome, well done! This looks incredible – it’s a dream of ours to try it. Your photos are CRAZY amazing! I’m so glad your experience changed your perception of these sharks – they really are majestic creatures!! I’m hoping to do this in either South Africa or Australia soon – your photos are INCREDIBLE!! fantastic pictures! i’m way too chicken to do this but my husband and daughter have done it. I was a nervous mom from afar. ;) Nice photos. I LOVE this post! I know exactly how you felt getting into the water for the first time. My first Scuba experience was similar, but I worked hard at talking myself off the ledge. Sharks have always fascinated me. Ever since I was a kid I wanted to swim with them and learn more about them. 3 years ago I volunteered with a white shark conservation in South Africa and learned so much about them. Like you said, you have to see their behavior for yourself to really understand. They are so calming to watch. I will never see them as a threat ever again, and I am so glad you were able to view the true nature of the shark as well.